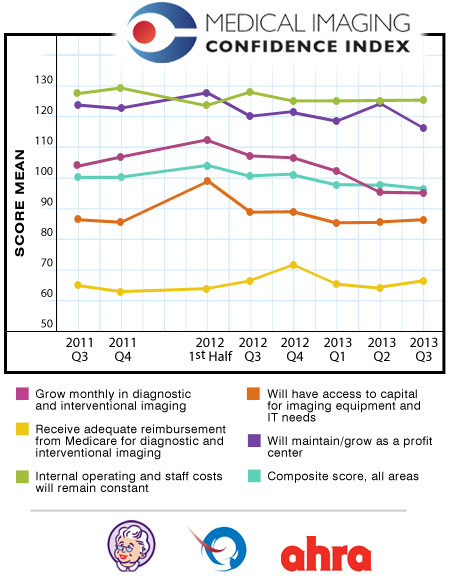 September 3, 2013 -- Radiology administrators remained deeply concerned about future Medicare reimbursement rates, showing little confidence that they will receive adequate Medicare payments in the third quarter of 2013, according to data from the Medical Imaging Confidence Index (MICI). The forward-looking index surveyed 144 imaging directors and hospital managers, asking their opinions of five key trends typically encountered by radiology administrators. The MICI survey is produced by market research firm the MarkeTech Group and AHRA. MICI gathered survey participants from across the U.S., with 12% based in the Pacific region, 10% in the Mountain region, 11% in the West North Central region, 18% in the East North Central region, 9% in the Mid-Atlantic region, 17% in the South Atlantic region, 12% in the East South Central region, and 11% in the West South Central region. As in previous surveys, optimism about receiving adequate Medicare reimbursement received the lowest score, at a mean of 63, or "very low confidence." At the other end of the scale, MICI survey respondents expressed high confidence that their internal operating and staff costs would remain constant, with a mean score of 126. Scores for all five categories and the composite index are below. The third-quarter MICI numbers are the subject of a Google Hangout between Ed Cronin, CEO of AHRA; Christian Renaudin, CEO and founder of the MarkeTech Group; and Brian Casey, AuntMinnie.com's editor in chief. You can view the Hangout by clicking on the video below. The MICI panel is a longitudinal cohort that consists of members of MarkeTech's ImagePro professional community, from which it selects radiology administrators to participate in studies. ImagePro members come from across the U.S. and represent different hospital sizes and geographic locations. The same members are queried with each survey round to ensure consistency of the results over time. The report results reflect national trends because participants are recruited by region and number of beds to reflect known American Hospital Association incidence, according to the MarkeTech Group and AHRA. Once the final counts are confirmed, MarkeTech performs statistical weighting to ensure the index reflects the U.S. hospital imaging market, the two firms said.